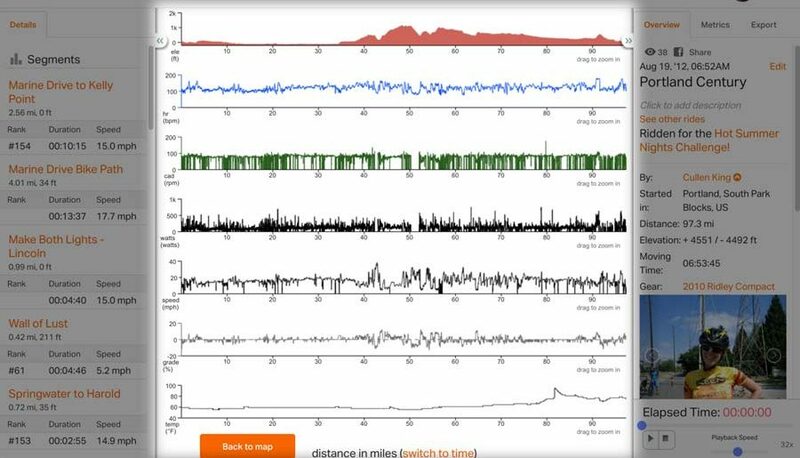 After you’ve completed a ride, there is a lot of data to make sense of — speed, distance, elevation, and more. 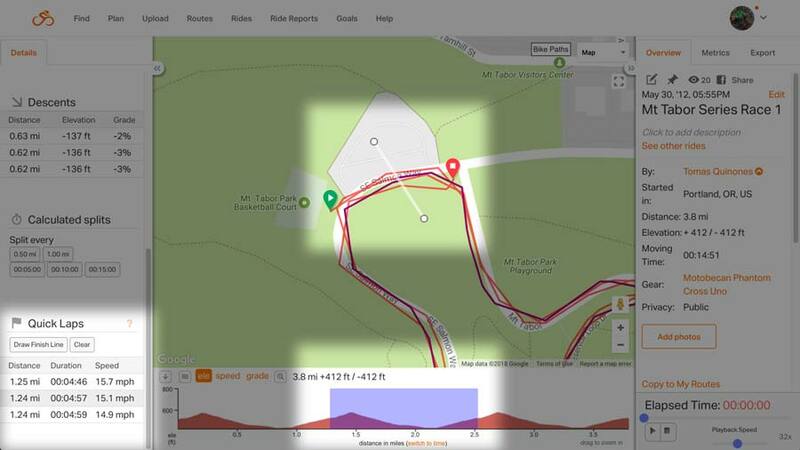 Learn about splits, quick laps, where to find your data, and ways to display the data. 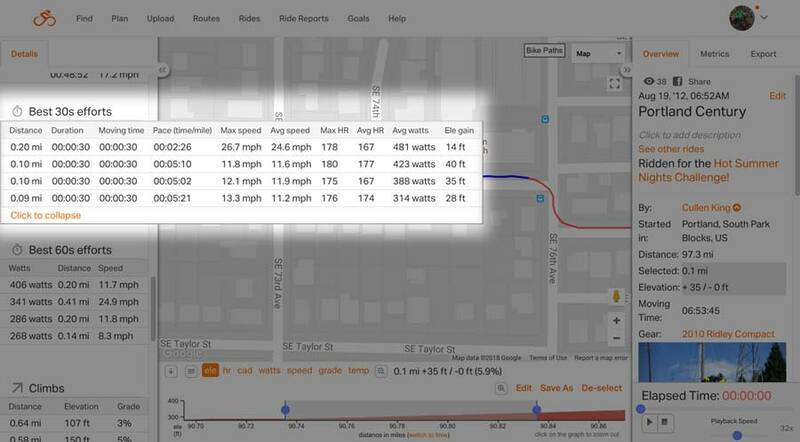 To view the Ride Center, click ANALYZE on the left hand navigation panel. 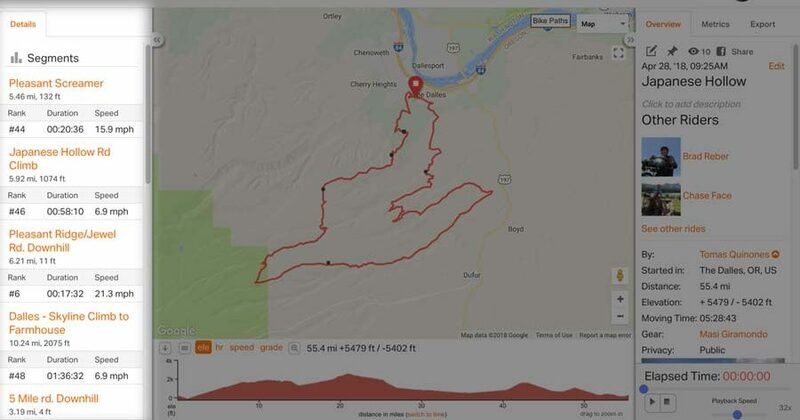 What’s a ride? 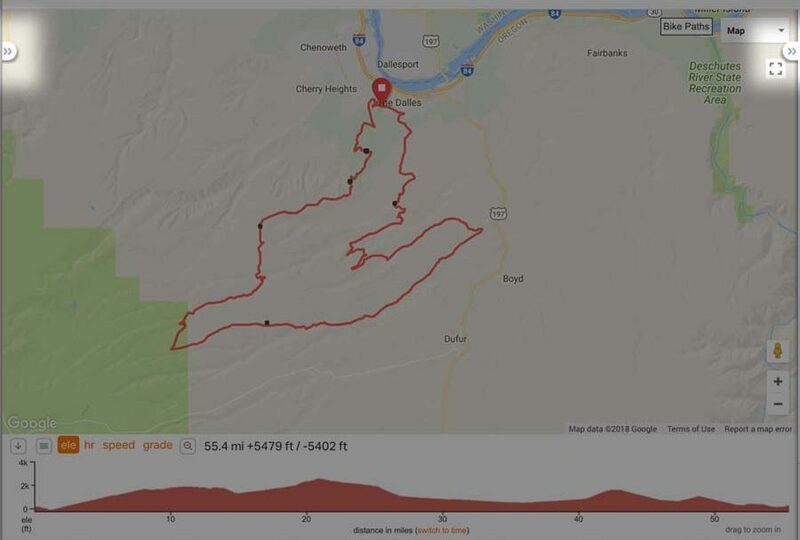 A ride (or run, hike, etc.) 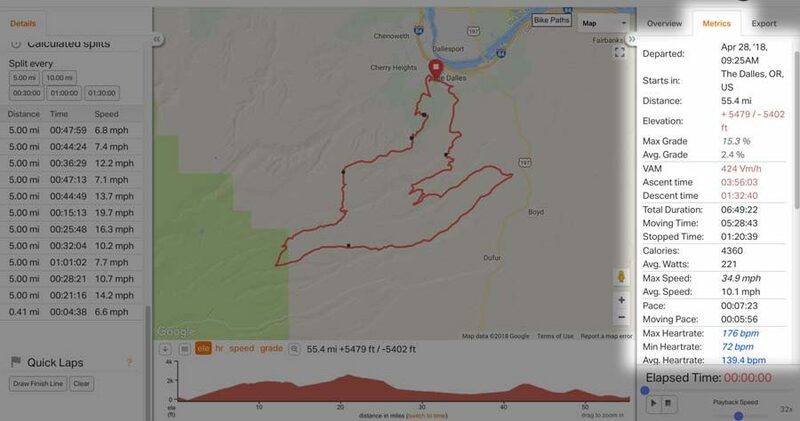 is an activity that you did on a particular day/time. 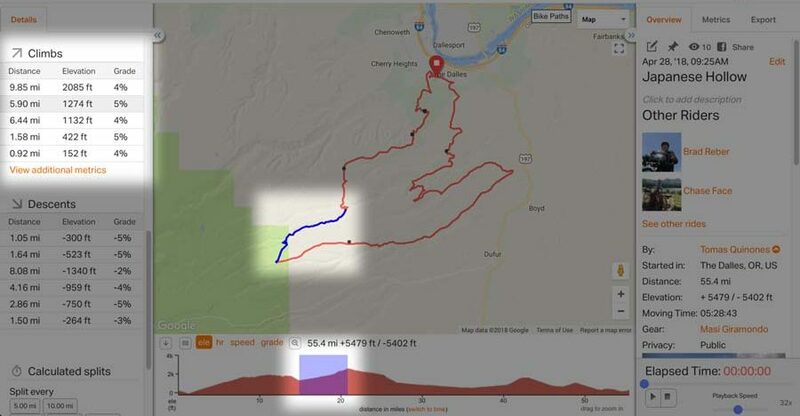 Whenever you upload data recorded from a GPS unit or the mobile app, you’re creating a ride on our site. 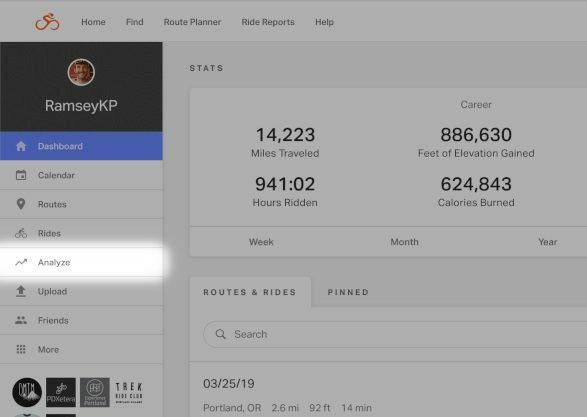 Every ride will have a metrics tab in the right side panel. Click on it to view more details about your ride. 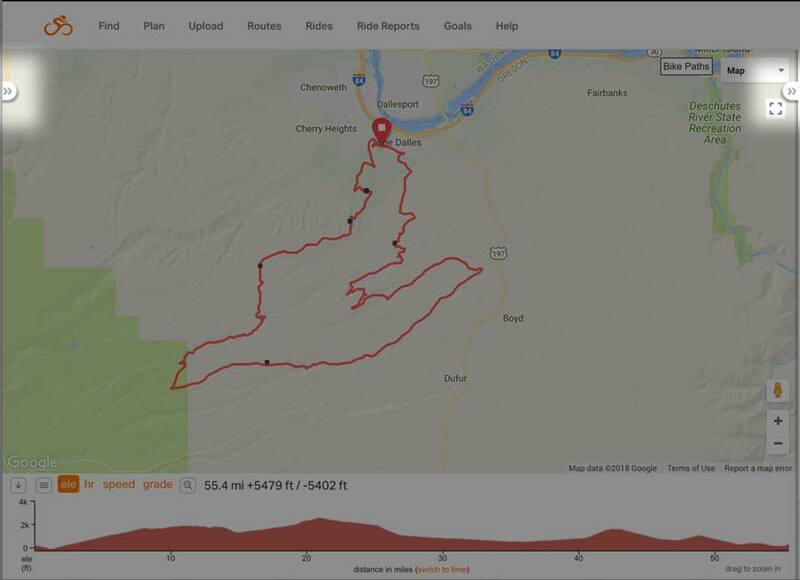 This is where you will find all the details about your ride including duration, distance, elevation gain, max grade, and much more. 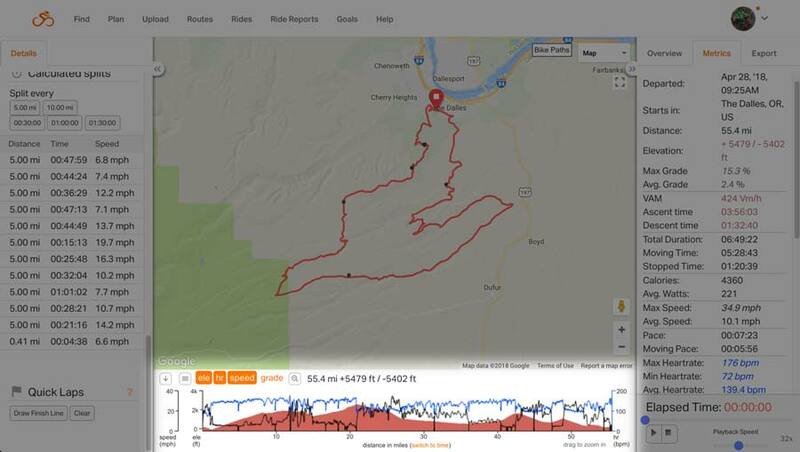 The Elevation Profile shows much more than just elevation. 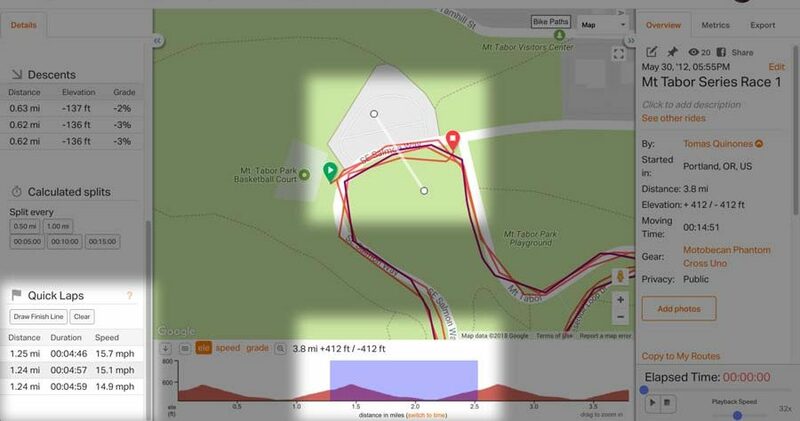 This is where you will see all available sensor data including heart rate, power, cadence, and temperature. 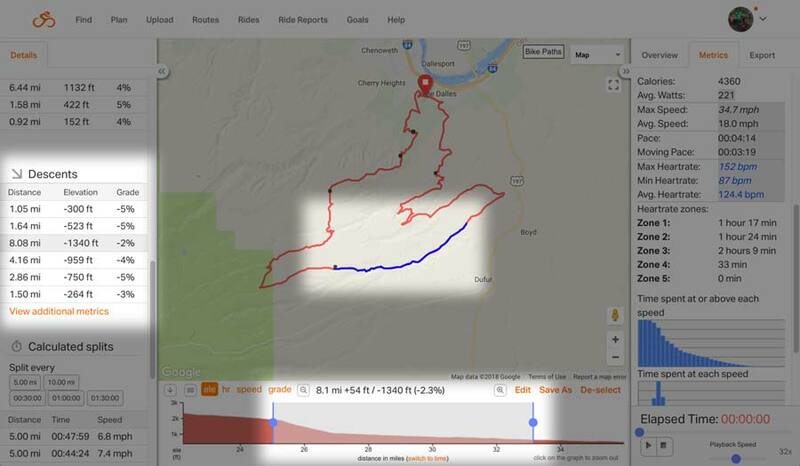 After making a selection in the elevation profile, the metrics will be highlighted in gray to reflect the selection. 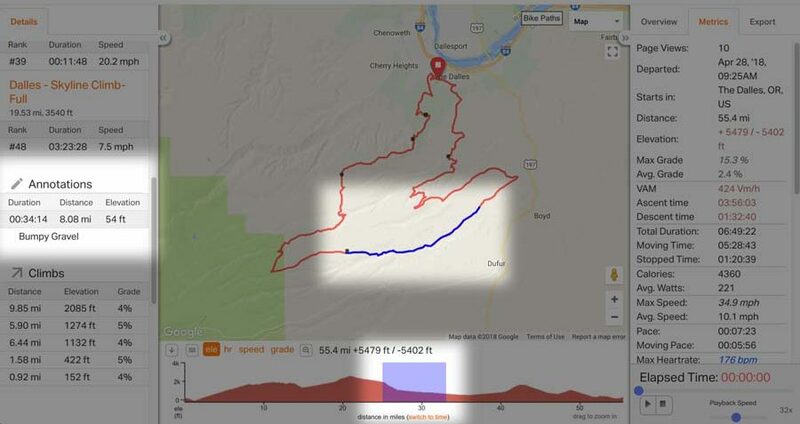 Clicking the Hamburger button on top of the elevation profile will take you to a page displaying all the available graphs for the ride. 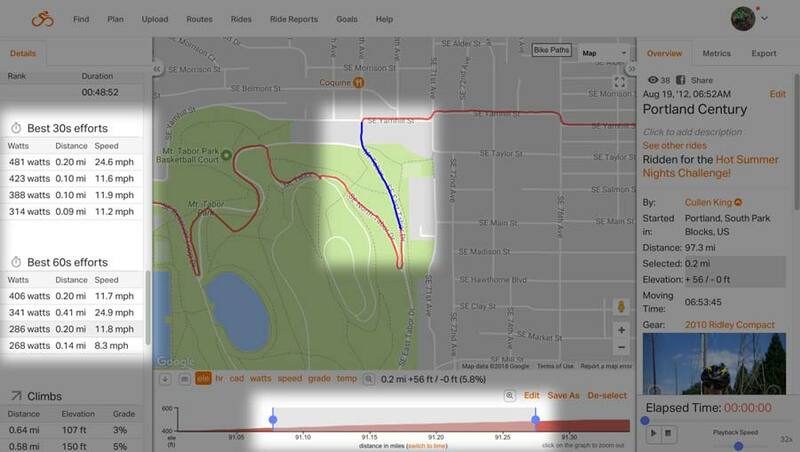 Segments are saved sections of the ride where your time is compared to other riders. 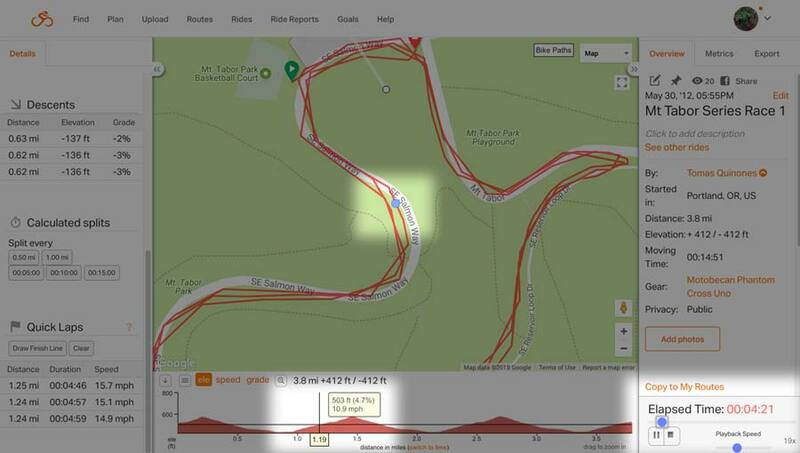 Click on the results of the segment to show it highlighted on the track on and elevation graph. 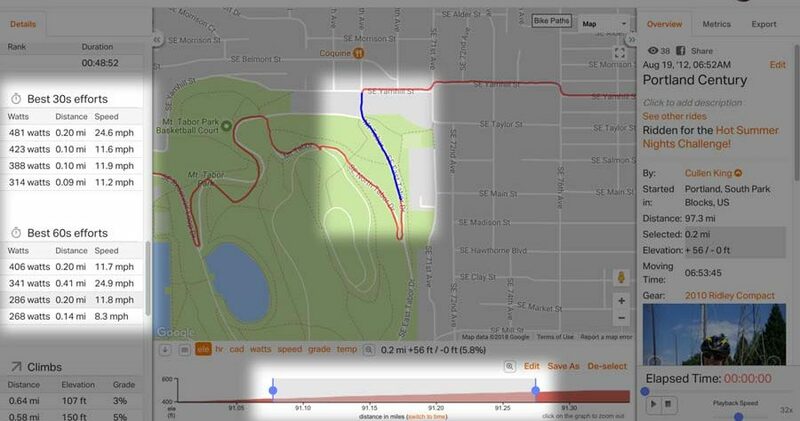 Annotations allow you to mark up a ride with notes about sections of the track. 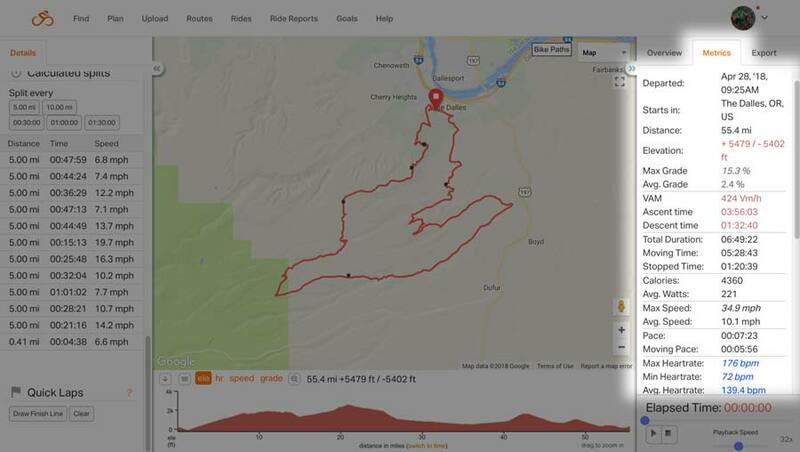 Great for pointing out surface types, views, or favorite sections. 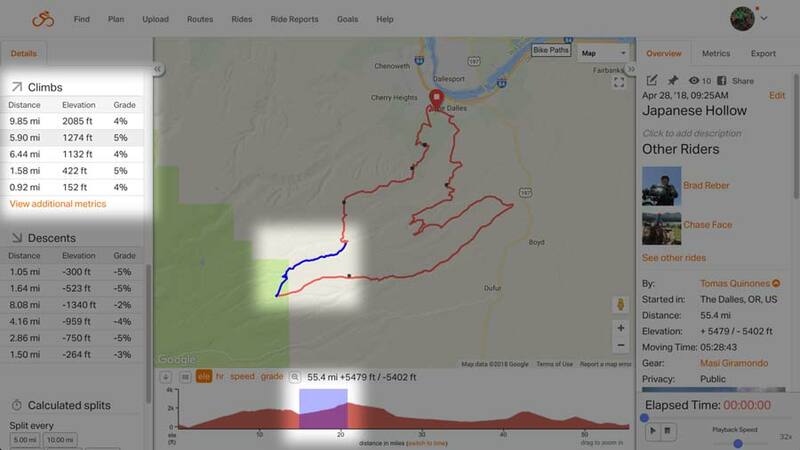 Watch your ride played back on the map by clicking Play in the bottom right side panel. Move the Playback Speed slider to change the rate of playback, default at 32x, slides all the way to 200x. 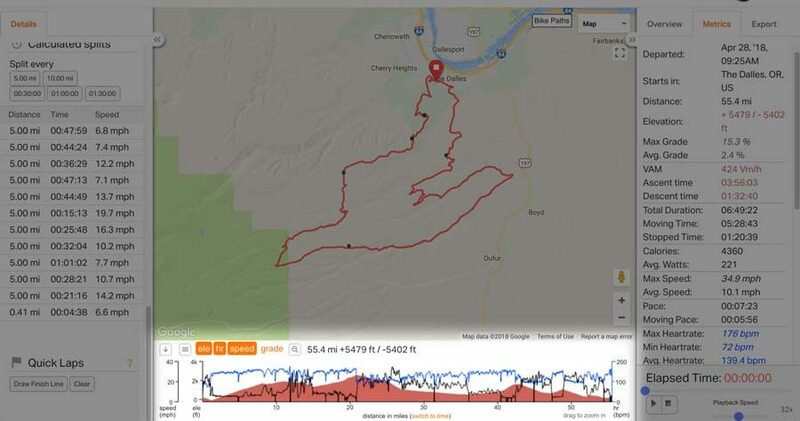 The Climbs section highlights all significant elevation gain longer than a half-mile (800 meters) and greater than 3% gain. 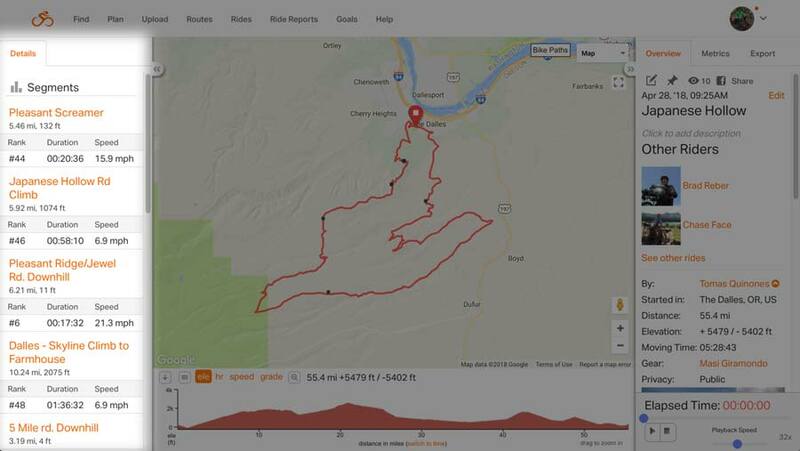 Climbs are also available on routes. 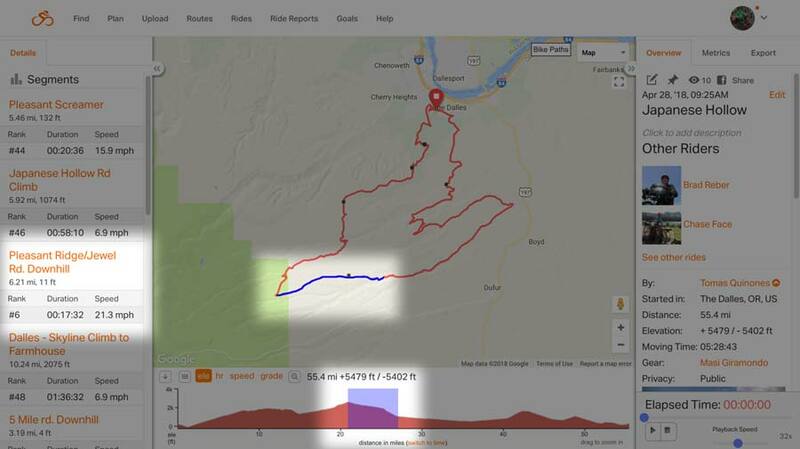 Click the climb distance to highlight the climb on the map and elevation profile. 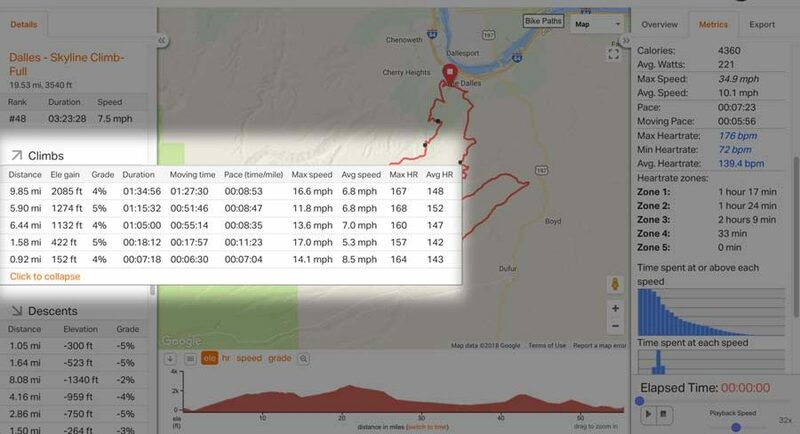 This will also show the grade and other metrics in the elevation profile and the right-side metrics tab. 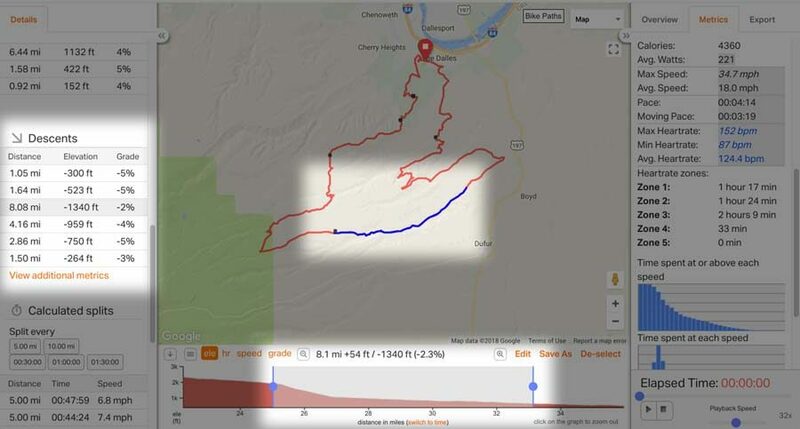 Click Show Additional Metrics to expand the Climbs and show more information. 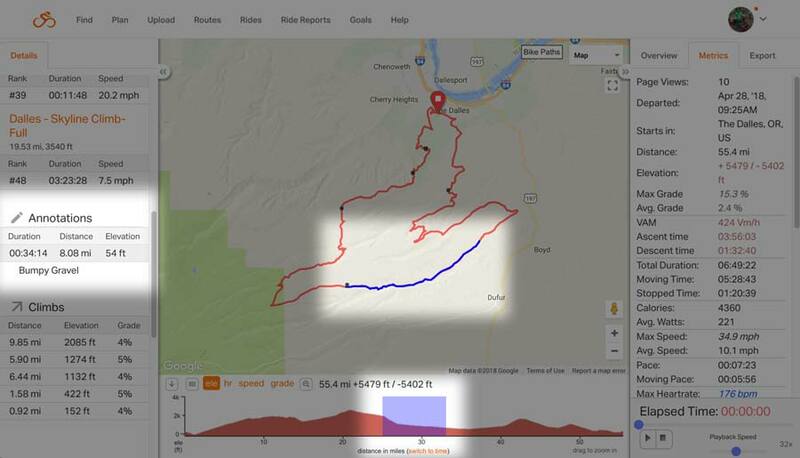 The Descents section highlights all significant elevation loss longer than a half-mile (800 meters) and greater than -3% decline. 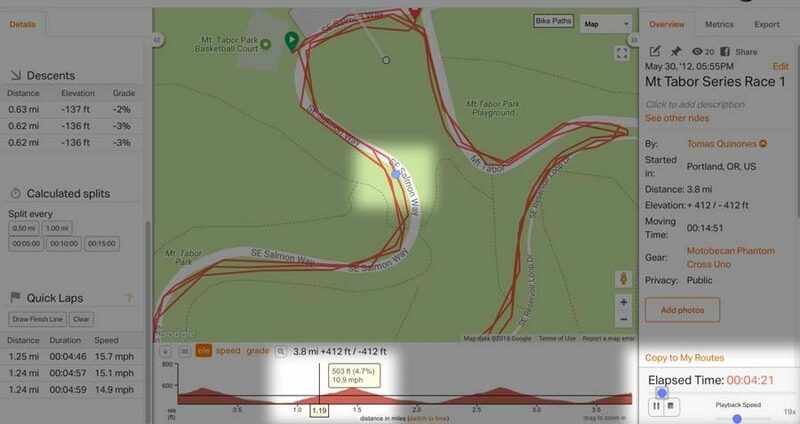 Descents are also available on routes. 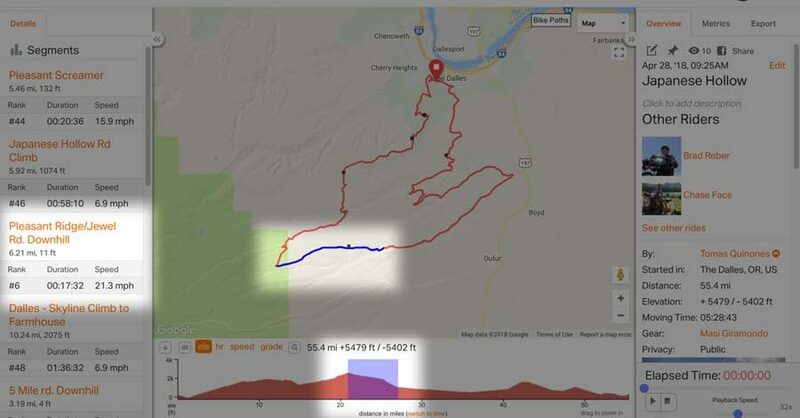 Click on the descent distance to have it highlighted on the map and elevation profile. 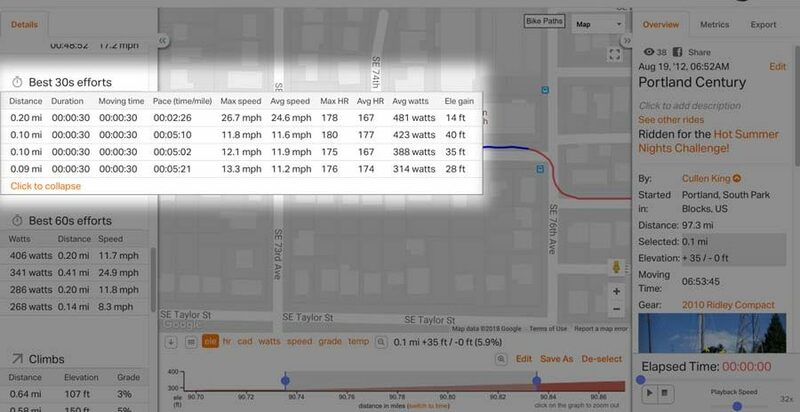 This will also show the grade, distance, and speed in the elevation profile and metrics tab on the right. 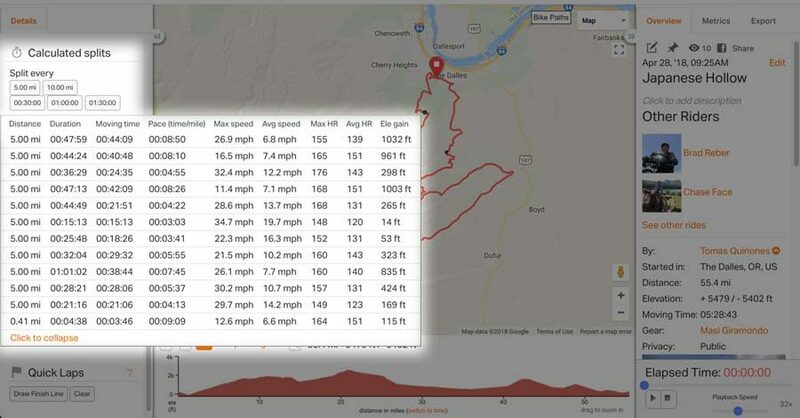 Click View Additional Metrics to expand the Descents metrics. The following features are for Premium subscribers. 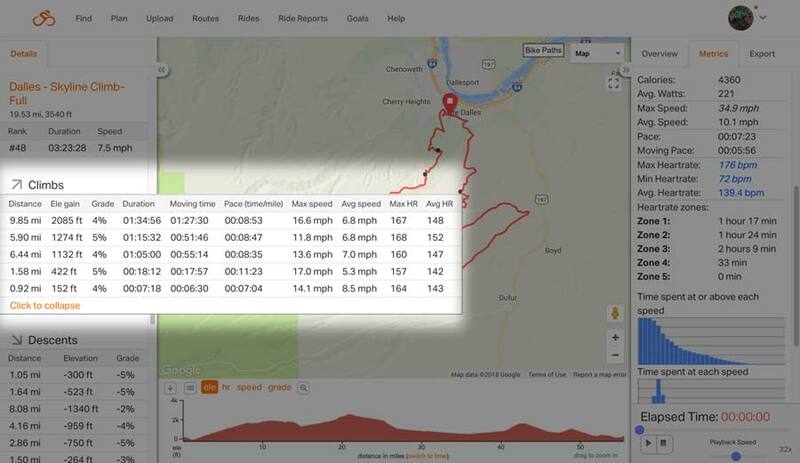 Any ride saved on a Premium account will have these features shown on the rides when viewed by any account level. 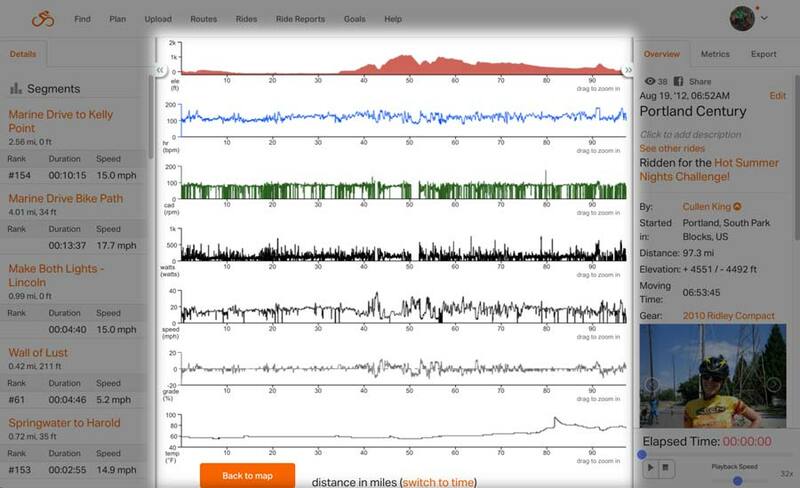 Rides recorded with a power meter will have a Best Efforts section. These show best 30-second efforts and best 60-second efforts. Click Reveal More Metrics to see an expanded view of all the efforts. 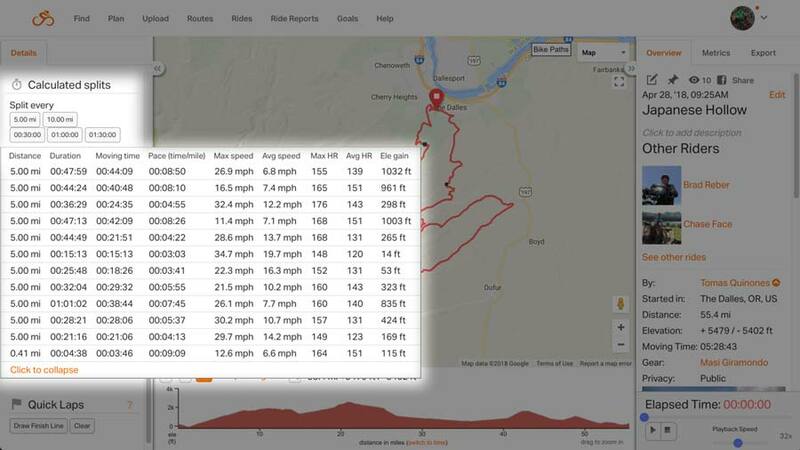 Click on one of the splits to see your metrics divided by mileage or by time. 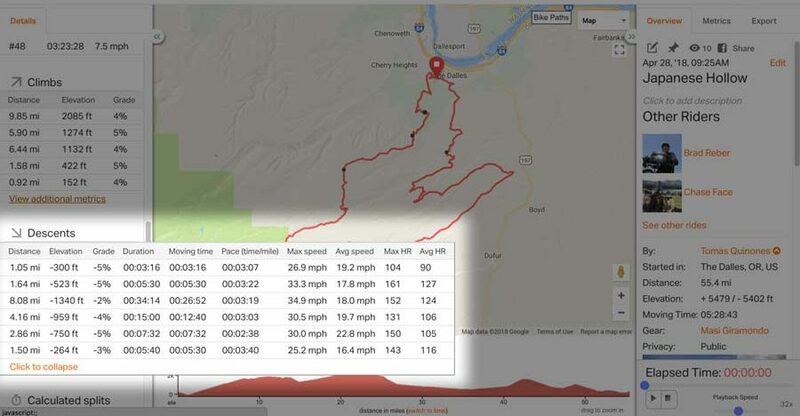 Click Reveal more Metrics for additional details on each split. 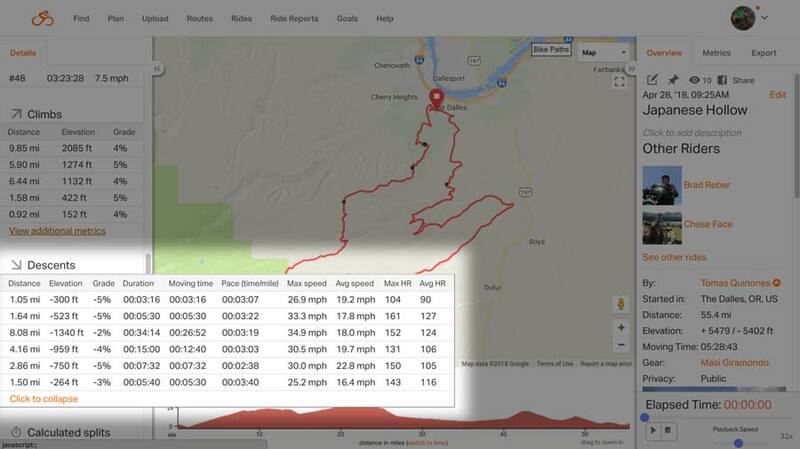 Quick Laps enables you to generate a table of lap times for any ride that does repeated runs on a circuit. If you don’t see the left or right side panels, click the (<<) or (>>) tabs to expand the panels.